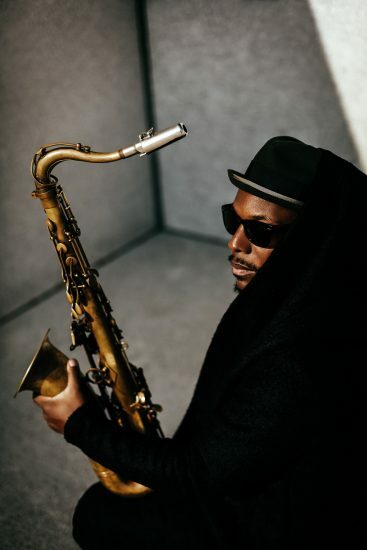 Born in Gainesville and raised in Miami, saxophonist Marcus Strickland and his twin brother, drummer E.J., were raised in a musical household thanks to a father devoted to a wide range of artists and styles. Strickland got his start as a sideman in various bands, including those led by Jeff “Tain” Watts, Roy Haynes and Dave Douglas. He went on to form his own groups, including the Twi-Life band and he even created his own record label Strick-Muzik which released several records by Strickland and his brother. He recently signed to Blue Note for whom he recorded Novi Nehi, produced by Meshell Ndegeocello. In addition to leading his own group, he’s also a member of the Blue Note All Stars band, which also features Robert Glasper, Ambrose Akinmusire, Lionel Loueke, Derrick Hodge and Kendrick Scott. That group will be performing on the Blue Note at Sea Cruise on January 27-February 3, 2018. He spoke with Lee Mergner about his mentors, the Blue Note All Stars and the importance of melody. Lee Mergner: You were on the inaugural sailing of Blue Note at Sea. What were your impressions? Marcus Strickland: There was incredible music, with the likes of Marcus Miller, Joshua Redman, Ben Williams who was playing with my group and with David Sanborn, James Francies, Greg Hutchinson … To have all those people in such close quarters is an incredible experience. I’m really looking forward to going on it again next February. People think that as working jazz musicians you get to hang out together all the time, but actually you’re more like ships passing in the night at various venues and festivals throughout the world. You don’t get to spend time talking or having breakfast or lunch or get to hear each other play. But on the cruise, it’s a different story. Exactly. With the cruise, it’s like we’re in one building all the time. And you can get a lot more intimate with people than usual. We get to know some of the passengers too. It’s always a great experience. I’m glad that Blue Note has gotten into this endeavor. Florida is in your blood. Although born in Gainesville, you were raised in Miami. How were you first introduced to jazz? My father introduced both me and my twin brother E.J. while we were still in the womb actually [laughs]. He used to play the music through the womb to us before we were even born. He always had incredible music playing throughout the house—all kinds of music. No specific genres, just great music. That’s all he cared about. He used to be the college DJ at the University of Miami and he used to be a drummer too. He had a great ear for music and for what was out there. He’d play Stevie Wonder, John Coltrane, Earth Wind & Fire, Jimi Hendrix … Just anything that was good at the time. For that generation, many of those genres were blended into the culture. Exactly. I learned from his collection that 1972 was a helluva year for music. A lot of the records that he played from that period were incredible, like Talking Book from Stevie Wonder and McCoy Tyner’s Trident. Stevie Wonder released some records a little bit after Talking Book, but I think Talking Book introduced that kind of sound he’s famous for. What a hot streak that was for him during that period with Innervisions, Music of My Mind and then Songs in the Key of Life. When we ask jazz artists what composers from the last 40-50 years they think will comprise the next Great American Songbook, inevitably they mention Stevie Wonder. Why do you think that is? I think a lot of it is just the incredible intricacy of the harmony of his tunes. His tunes have very interesting harmonic progressions, but at the same time they’re singable and accessible and that’s why he appeals so much to jazz musicians. That’s the ultimate goal of a jazz musician. I often wish more tunes that jazz musicians did were more melodic and accessible. I think that many jazz musicians have lost the interest of the people who came to see them play. They’re trying to be over their heads. People feel more intelligent that way, but music isn’t about showing off what you know that someone else doesn’t know. For me music is a way of communicating—being a vessel for communication. If we’re going to commune, it shouldn’t be something that’s over people’s heads. For example, the genius of Michael Jackson is that he was incredible at dancing, at singing … Have you ever heard his warm-up [exercises]? There are recordings of him warming up and the range of his voice goes from top of the baritone to the soprano. But even though he had all these skills and this incredible knowledge of music, he was able to make music that was appealing to everybody, not just to a certain type of person. Louis Armstrong, at the time he was the pop star or the first King of Pop, he had that same quality. I think that some jazz musicians have lost sight of that. Some of it is just the melody that isn’t always there in modern jazz. One thing that is very appealing to me about John Coltrane is that his melodies were real melodies. Like “Alabama” or “Naima” or “A Love Supreme” or “Cousin Mary.” They are very simple melodies, but he got to the business after that. Songwriting is being swept under the rug sometimes when I hear jazz concerts. That’s one thing that I really pay attention to with my music, especially of late. With the last three records I’ve been paying attention to melodic content. That’s my goal. I want people whistling my tunes. A lot of jazz people look down at pop music as being too simple. But if it’s so simple and easy, you try to write a hit song. It’s a lot harder than most people think. It really is. Too many jazz people look down upon anything that makes money. I think that’s the wrong approach. Jazz music used to be pop music. It used to be the most popular music on the face of the planet. They paid attention then to the songs and to the audience. A lot of times I can tell when a jazz musician doesn’t have any respect for pop or anything else other than jazz, or doesn’t even listen to it. I can hear it in their sound. I can hear it in people who are paying attention to what’s happening in the rest of the world. There’s a very big difference. Both are needed, I suppose. Some people like to explore in one particular vein, but me, I don’t really see genres these days. I’m mostly concerned with representing who I am as a person. And who I am as a person is: I like music, period. You put on some J Dilla, I’m going to enjoy that just as much as a Coltrane record. It’s very different. Each song comes about a different way. On my last record, a lot of them came from a massive collection of beats that I had made over the years. A lot of those grew into songs and ended up on that record. The music on that record, Nihil Novi (on Blue Note) which translates from Latin as “nothing new,” I got that out into my songwriting repertoire. Lately, I’ve been writing tunes and they’re coming in all different ways. Sometimes they come from a beat. Sometimes it’s a melody that just pops into my head. A lot of times when I’m watching movies, something will come up in my consciousness and I hear it and I have to record it on my phone, and then go back and watch the rest of the movie. I’m liking the freedom of it. The less I think of genres, the more I become myself and the more realistic the music is. I listen to my iPhone all the time and I’m jumping to all kinds of different music at the same time. I’ll listen to Thundercat and the next five minutes is Joshua Redman and the next is José González. My musical DNA is big plethora of great sounding music and that’s what I grew up on in the first place. That’s my direction currently—I want to present all of who I am instead of staying in some kind of lane. The thing that’s great about jazz is that it’s kind of like a sponge in that it absorbs and extracts at the same time. A lot of music lovers end up being jazz musicians, I guess because we’re just music nerds [laughs]. It’s great to be at this juncture where I don’t feel any boundaries. I’m just letting it out and free. I’m not worried about the jazz police. I’m just creating music. Have you ever performed in front of a large non-jazz audience, like at a pop, rock or R&B music festival? Yes, I played some gigs with Queen Latifah and with Mos Def. And I’m on a Bilal record. I’ve been in many different situations. There was one time where I sat in with Flying Lotus at LPR in NYC and I played the melody of this Thundercat song and as soon as I started playing it, the crowd went berserk. It’s an incredible feeling for the audience to actually know the music and be able to sing along and be there with you. I’m liking the way that music is going these days. I know that there are purists out there who are saying, “There isn’t any more swing and …” I don’t really care about that stuff. I say that anything that grooves is swinging. It’s like a certain type of shape or human quality to the rhythm that occurs when it really grooves. When someone has an incredible pocket, then that thing is swinging in its own way. It’s very liberating to no longer feel that I have to do this or I have to do that. This is what it is. You had sideman gigs with two very different bandleaders—Roy Haynes and Dave Douglas. What did you learn from each of them about leading a band or about music in general? The importance of melody is something I learned from Roy Haynes. Roy would warm up on the drums and I would know exactly what song he was playing, just from the way he was shaping the rhythm. He knew the lyrics to most of the songs that we played during the set. He really taught me how we should worship the melody and how important it is to the song. The phrasing was very important. He liked certain fingerings or phrasing on songs. He’ll say that “I want you to phrase it like Sarah Vaughan did,” or “On this song, I like the way Ella did it.” I learned all that from Roy. From Dave Douglas I think I learned a lot about being a driven bandleader. He’s unstoppable. He really understands what it takes to get your voice heard. He’s an excellent bandleader, businessman. And musically, the particular group I played with, we did a lot of soundscapes along with films. It was a very good experience to be in that type of band. I’m very proud that I can be in such a wide spectrum of bands. I think that indicates virtuosity. One thing I admire about Roy Haynes is the incredible amount of bands he was in and how they were so different from one another—like Eric Dolphy or Lester Young or Charlie Parker or Chick Corea. I really enjoy the path my career has taken, which is a wide spectrum. I just hope it keeps on growing and expanding. One thing you did like Dave is that you created your own record label—Strick-Muzik—and you put out albums by yourself and your brother. What was that process like for you? My decision to start my own label came out of a need, because I was on a small label, Fresh Sounds, at that time. They wanted me to do a third record, but I wanted something more out of the records and their impact. I learned a lot about the industry that way. I decided to make a label because my intention was to put out several records instead of just putting out a record. I learned a lot. I fell on my face in some ways. But in other ways I flourished more than I did on the small label I was on before. Most importantly, I had the freedom to put out music whenever I wanted for whatever budget I wanted and advertise it the way I wanted. I had a lot of power that way. Now I’m on Blue Note and surprisingly, I’ve had a lot of creative freedom. I have to adjust to certain things. I used to run everything. It was an interesting endeavor. Who knows, I might revisit it. More musicians should try it. We’re being forced to do it nowadays. Did the legacy of Blue Note Records loom large to you? Or was it just a matter of the past is past and the present is now? It’s an incredible legacy that the label has. [Getting signed] was very surprising at the same time. I’m very glad to be part of that family. I can’t wait to see the many things we’ll do in the future. One of the things we’ve been planning is a live recording of the Twi-Lite group on the next European tour. I always have some music laying around for making tracks. This week I’m working on a track with Bilal that might end up on the next record. I feel very fortunate to be part of such an incredible label. It’s an honor and at the same time, big shoes have to be filled. But I’m up to the task. Your last album was produced by bassist/singer Meshell Ndegeocello. What was it like to have her perspective and influence with the recording? It was a great experience. I’m so glad that I did it. I’ve grown in so many ways because of that. I think it was a great choice for that particular record. When I was thinking of a person to produce that record, I came up with no one other than Meshell. Her music is genre-less. I can’t say that it’s one particular thing. She has a very distinctive sound and she’s a hero of mine. To work with her on something that meant so much to me was an absolute honor. To see her in the studio was one of the most incredible experiences of my life. It changed me as a musician. I think jazz musicians are so obsessed with playing in the moment or getting the perfect take, but there are so many other things that can go into the equation, like the type of room you’re recording in or the sound you want to have on the record or how it’s going to be mixed or who is going to be your recording, mixing or mastering engineer. There is all this other stuff that is sometimes neglected in acoustic music. I learned a lot of that stuff working with Meshell and also working with Charles Haynes who did some co-producing and working with Chris Dave and also having Robert [Glasper] come in on a track. It was an incredible family of people that were very generous with the information that they’ve accumulated over the years. It was mind-blowing. I’m so glad I made that record. Jean Baylor was a part of the album as well, singing and adding lyrics to some of the songs. She’s limitless. It’s very telling that she can sing the way she does and that she can write lyrics just as well and so efficiently. Sitting with her and co-writing the songs together was an amazing experience. She’s a one-take wonder. You’re not going to be there all day. She’s going to give you what you need probably in the first or maybe even the second take. She’s incredible. It’s changed me as a musician and as a person. I’ve learned so much as a bandleader from that record because there are so many hats to wear at the same time. You’re playing with the Blue Note All Stars group on the Blue Note at Sea cruise. It’s crazy, the experiences I’ve had with that band. I can’t wait until the new record comes out. It even has Herbie Hancock and Wayne Shorter on one cut. The band features Ambrose Akinmusire, Robert Glasper, Derrick Hodge, Kendrick Scott and Lionel Loueke. Lionel is a singular talent with a very unique sound on the guitar. Oh yes, there is no confusing him with anyone else. He’s a singular person in this world. It almost looks like he’s constructing a new guitar when I look over at him and he’s got his hands all in weird places. With an all-star group it can be a challenge to make it really a band. How does it become more than the sum of its parts? The most important part was that Robert assembled the band and we got guys that he admired and who he’s played with and put them all in the same room. We were all family from the get-go. We were already affiliated with each other in many different combinations. It really felt like family. These are all my brothers. It was very natural. At the same time I felt something very special in my heart to play with that particular group of people. We have incredible fun on the road. That can be underrated for a band to get along off the bandstand. You can see that with Wayne Shorter’s quartet, just as an example. It’s very important. That’s definitely an incredible band to see live. I had the honor of seeing Wayne and the quartet because my trio opened for them in France. That was an incredible experience. To be backstage and hear the acoustic sound of that group before it hits the mics and gets processed. They are definitely on the same wavelength and there’s a whole lot of trust. They can go in many different directions. I feel similarly when I play with the Blue Note All Stars. You have that common history and influences. I’m working on a few tracks for my next record. I’m just excited about music and I can’t wait to present the new record. It’s going to be very heartfelt. That’s my only goal—to present something that representative of what I’m feeling at the time. One thing I really appreciate about all the guys in the Blue Note All Stars group is that they all are interested in crafting albums. How do you use electronics with your saxophone? I have a guitar pedal system. I have two channels, one with a pure saxophone sound and one that goes through the pedal system to blend them together. It’s all machines, including the saxophone. The limits need to be pushed. And reach for the people out there—the young people too, not just the nostalgic audiences.